Free Download MediaMonkey 4.1.20.1864 - Multimedia player and manager with extras. MediaMonkey is a free digital media player and manager which can be upgraded to Gold edition to get even more features. It can be extended to handle video and other media formats with the help of plugins. MediaMonkey supports MP3, AAC/M4A, OGG, WMA, MPC, APE, FLAC, WAV, WMV, AVI, MP4, MKV, etc. It can adjust volume levels automatically. MediaMonkey's multimedia manager can handle collections with more than 100.000 files. It will organize files located on your hard drive, CDs, network. The Media Tree view offers a convenient way to browse your database by collections, different attributes like title, genre, podcasts, playlists, media servers, portable/audio devices, etc. MediaMonkey also allows you to filter your music and video. You can then create a playlist that includes the filtered music. The music manager contains a tag editor to correct music file information, add ratings, mood, etc. for many supported formats. Missing tags can be looked up online, e.g. on Amazon, CD information on FreeDB. The Auto-Tagger will automatically tag files based on filenames. Auto-Organize Files will use the existing track properties to move and rename files according to the specified format. MediaMonkey can sync music files with portable audio devices such as iPod, iPhone, Palm Pre, and Android-based devices. It can rip music from Audio CDs to the hard drive and convert to the supported formats with excellent quality, preserving tags. Music can be burned to the CD/DVD format in the compressed or CD audio format. MediaMonkey offers jukebox mode for parties, which allows users making requests while protecting your collection from being altered. Auto-DJ will play tracks automatically based on the criteria you define. MediaMonkey can be customized with skins, visualizations, plug-ins, and other addons to extend its functionality. It integrates with other applications such as sound editors, metadata lookup addons, customized reports, customized views. This is the best and most complete tool for your music collection. I have been looking for something like this for years. Now I can stop looking and listen to my music instead. sync with any mp3 player as far as I know, including ipods. The only problem is that it is somewhat a resource hog and crashed on me once. But definitely worth a look if you like the itunes interface but want management options that exceed even winamp, much less itunes. Great, easy to use software. Only con is not freeware. The best management tool for my needs. Absolutely bloody superb... and worth the money to upgrade to the gold version if you decide you need the extra features. converting all my Live albums from FLAC to mp3, virtually no quality losx½ÊK192kps. Great program. Mediamonkey handles them with ease. The database it creates is in ACCESS form which means you can use it for reports and lists - great for the librarian junky. MediaMonkey, you don't go back. It is fully customizable with scripts, plug-ins and easy to make skins. Polite and helpful support team in the forums. Superb, well thought out program. 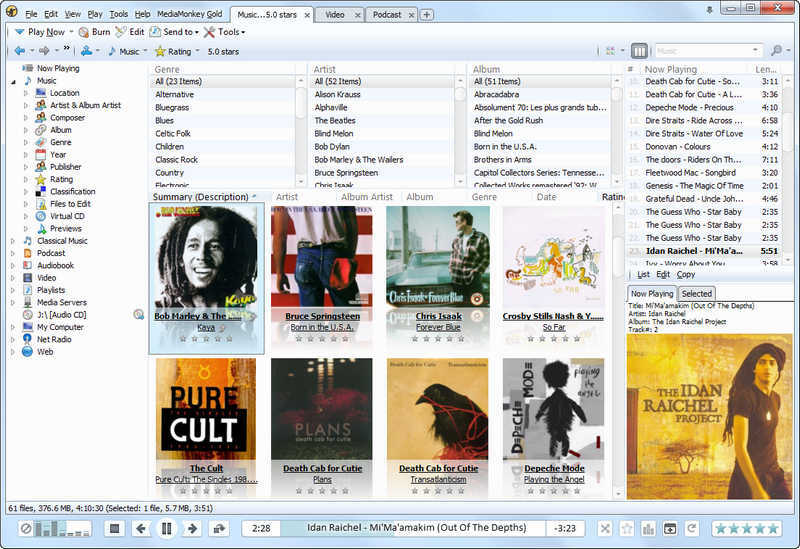 MediaMonkey 4.1.20.1864 - A great tool to keep your music and video collection organized. Free!